Above we reproduce a chart from our latest newsletter StorInttm Dispatch on SPECsfs(R) 2008 benchmark results. This chart shows the top 10 CIFS throughput benchmark results as of the end of last year. As observed in the chart Apple’s Xserve running Snow Leopard took top performance with over 40K CIFS throughput operations per second. My problem with this chart is that there are no enterprise class systems represented in the top 10 or for that matter (not shown in the above) in any CIFS result. Now some would say it’s still early yet in the life of the 2008 benchmark but it has been out now for 18 months and still has not a single enterprise class system submission reported. Possibly, CIFS is not considered an enterprise class protocol but I can’t believe that given the proliferation of Windows. So what’s the problem? I have to believe it’s part tradition, part not wanting to look bad, and part just lack of awareness on the part of CIFS users. Traditionally, NFS benchmarks were supplied by SPECsfs and CIFS benchmarks were supplied elsewhere, i.e., NetBenc. However, there never was a central repository for NetBench results so comparing system performance was cumbersome at best. I believe that’s one reason for SPECsfs’s CIFS benchmark. Seeing the lack of a central repository for a popular protocol, SPECsfs created their own CIFS benchmark. Performance on system benchmarks are always a mixed bag. No-one wants to look bad and any top performing result is temporary until the next vendor comes along. So most vendors won’t release a benchmark result unless it shows well for them. Not clear if Apple’s 40K CIFS ops is a hard number to beat, but it’s been up there for quite awhile now, and has to tell us something. CIFS users seem to be aware and understand NetBench but don’t have similar awareness on SPECsfs CIFS benchmark yet. So, given today’s economic climate, any vendor wanting to impress CIFS customers would probably choose to ignore SPECsfs and spend their $s on NetBench. The fact that comparing results was neigh impossible, could be considered an advantage for many vendors. So SPECsfs CIFS just keeps going on. One way to change this dynamic is to raise awareness. So as more IT staff/consultants/vendors discuss SPECsfs CIFS results, its awareness will increase. I realize some of my analysis on CIFS and NFS performance results doesn’t always agree with the SPECsfs party line, but we all agree that this benchmark needs wider adoption. Anything that can be done to facilitate that deserves my (and their) support. So for all my storage admins, CIOs and other influencers of NAS system purchases friends out there, you need to start asking to about SPECsfs CIFS benchmark results. All my peers out their in the consultant community, get on the bandwagon. 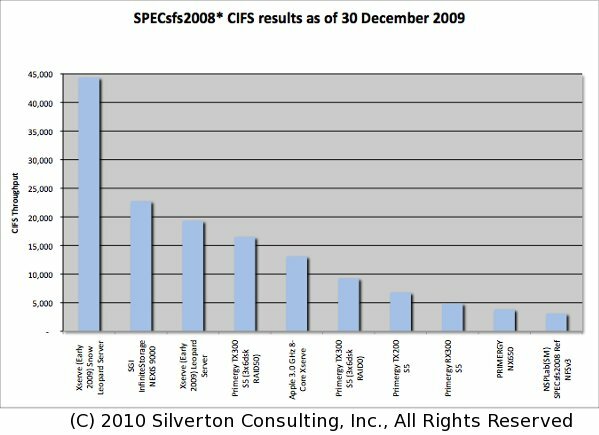 As for my friends in the vendor community, SPECsfs CIFS benchmark results should be part of any new product introduction. Whether you want to release results is and always will be, a marketing question but you all should be willing to spend the time and effort to see how well new systems perform on this and other benchmarks. Our full report on the latest SPECsfs 2008 results including both NFS and CIFS performance, will be up on our website later this month. However, you can get this information now and subscribe to future newsletters to receive the full report even earlier, just email us at SubscribeNews@SilvertonConsulting.com?Subject=Subscribe_to_Newsletter. 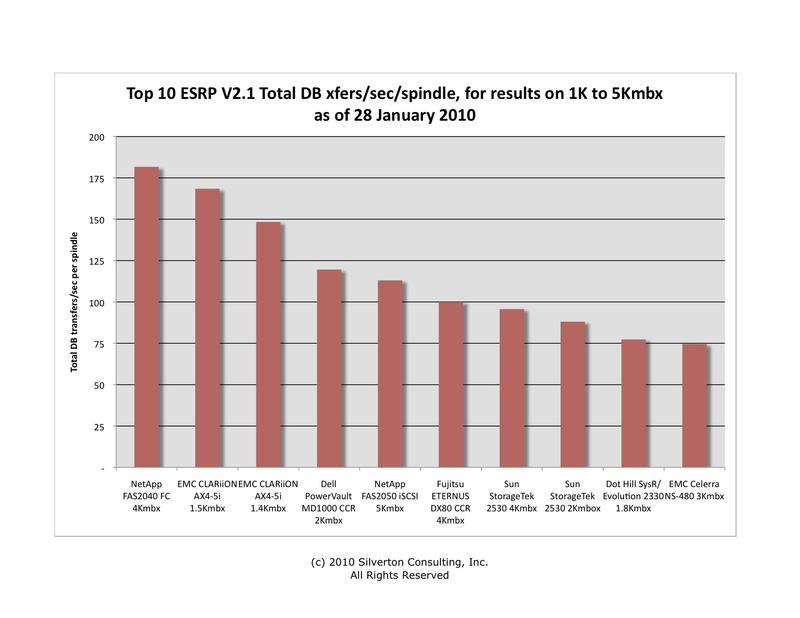 Latest SPC-2 (Storage Performance Council-2) benchmark resultschart displaying the top ten in aggregate MBPS(TM) broken down into Large File Processing (LFP), Large Database Query (LDQ) and Video On Demand (VOD) throughput results. 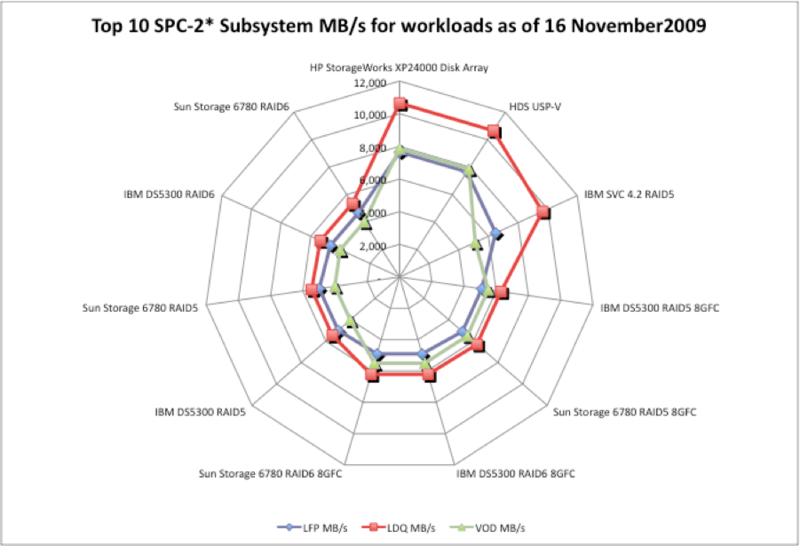 One problem with this chart is that it really only shows 4 subsystems: HDS and their OEM partner HP; IBM DS5300 and Sun 6780 w/8GFC at RAID 5&6 appear to be the same OEMed subsystem; IBM DS5300 and Sun 6780 w/ 4GFC at RAID 5&6 also appear to be the same OEMed subsystem; and IBM SVC4.2 (with IBM 4700’s behind it). LDQ is a workload consisting of 1024KiB and 64KiB transfers whereas the LFP consists of 1024KiB and 256KiB transfers and the VOD consists of only 256KiB, so transfer size doesn’t tell the whole story. LDQ seems to have a lower write proportion (1%) while attempting to look like joining two tables into one, or scanning data warehouse to create output whereas, LFP processing has a read rate of 50% (R:W of 1:1) while executing a write-only phase, read-write phase and a read-only phase, and apparently VOD has a 100% read only workload mimicking streaming video. 50% of the LDQ workload uses 4 I/Os outstanding and the remainder 1 I/O outstanding. The LFP uses only 1 I/O outstanding and VOD uses only 8 I/Os outstanding. I was going to say they must have a better sequential detection algorithm but the VOD, LDQ and LFP workloads have 100%, 99% and 50% read ratios respectively and sequential detection should perform better with VOD and LDQ than LFP. So thats not all of it. Next I was going to say it had something to do with I/O outstanding counts. But VOD has 8 I/Os outstanding and the LFP only has 1, so the if this were true VOD should perform better than LFP. While LDQ having two sets of phases with 1 and 4 I/Os outstanding should have results somewhere in between these two. So thats not all of it. Next I was going to say stream (or file) size is an important differentiator but “Segment Stream Size” for all workloads is 0.5GiB. So that doesn’t help. So now I am a complete loss as to understand why the LDQ workloads are so much better than the LFP and VOD workload throughputs for HDS and SVC. I can only conclude that the little write activity (1%) thrown into the LDQ mix is enough to give the backend storage a breather and allow the subsystem to respond better to the other (99%) read activity. Why this would be so much better for the top performers than the remaining results is not entirely evident. But I would add that, being able to handle lots of writes or lots of reads is relatively straight forward, but handling a un-ballanced mixture is harder to do well. To validate this conjecture would take some effort. I thought it would be easy to understand what’s happening but as with most performance conundrums the deeper you look the more confounding the results often seem to be. The full report on the latest SPC results will be up on my website later this year but if you want to get this information earlier and receive your own copy of our newsletter – email me at SubscribeNews@SilvertonConsulting.com?Subject=Subscribe_to_Newsletter. I will be taking the rest of the week off so Happy Holidays to all my readers and a special thanks to all my commenters. See you next week. The adjacent chart is from our September newsletter and shows the top 10 NFSv3 throughput results from the latest SPEC(R) sfs2008 benchmark runs published as of 25 September 2009. There have been a number of recent announcements of newer SPECsfs2008 results in the news of late, namely Symantec’s FileStore and Avere Systems releases but these results are not covered here. In this chart, the winner is the NetApp FAS6080 with FCAL disks behind it, clocking in at 120K NFSv3 operations/second. This was accomplished with 324 disk drives using 2-10Gbe links. The #3 result had a FAS3160, running 56 FCAL disks with PAM II cards and DRAM cache of 532GBs. The system attained 60.5K NFSv3 operations per second. The #4 result had a FAS3160, running 224 FCAL disks with no PAM II cards but 20GB of DRAM cache. This system attained 60.4K NFSv3 ops/second. The #5 result had a FAS3160, running 96 SATA disks with PAM II cards and DRAM cache of 532GBs. This system also attained 60.4K NFSv3 ops/second. Similar results can be seen with the FAS3140 systems at #8, 9 and 10. In this case the FAS3140 systems were using PAM I (non-NAND) cards with 41GB of cache for results #9 and 10, while #8 result had no PAM with only 9GB of Cache. The #8 result used 224 FCAL disks, #9 used 112 FCAL disks, and #10 had 112 SATA disks. They were able to achieve 40.1K, 40.1K and 40.0K NFSv3 ops/second respectively. Don’t know how much PAM II cards cost versus FCAL or SATA disks but there is an obvious trade off here. You can use less FCAL or cheaper SATA disks but attain the same NFSv3 ops/second performance. As I understand it, the PAM II cards come in 256GB configurations and you can have 1 or 2 cards in a FAS system configuration. PAM cards act as an extension of FAS system cache and all IO workloads can benefit from their performance. As with all NAND flash, write access is significantly slower than read and NAND chip reliability has to be actively managed through wear leveling and other mechanisms to create a reliable storage environment. We assume either NetApp has implemented the appropriate logic to support reliable NAND storage or has purchased NAND cache with the logic already onboard. In any case, the reliability of NAND is more concerned with write activity than read and by managing the PAM cache to minimize writes, NAND reliability concerns could easily be avoided. The full report on the latest SPECsfs2008 results will be up on my website later this week but if you want to get this information earlier and receive your own copy of our newsletter – email me at SubscribeNews@SilvertonConsulting.com?Subject=Subscribe_to_Newsletter. Full disclosure: I currently have a contract with NetApp on another facet of their storage but it is not on PAM or NFSv3 performance. The above chart shows the top 12 LRT(tm) (least response time) results for Storage Performance Council’s SPC-1 benchmark. The vertical axis is the LRT in milliseconds (msec.) for the top benchmark runs. As can be seen the two subsystems from TMS (RamSan400 and RamSan320) dominate this category with LRTs significantly less than 2.5msec. IBM DS8300 and it’s turbo cousin come in next followed by a slew of others. Aside from the blistering LRT from the TMS systems one significant item in the chart above is that the two IBM DS8300 systems crack the <1msec. barrier using rotating media. Didn’t think I would ever see the day, of course this happened 3 or more years ago. Still it’s kind of interesting that there haven’t been more vendors with subsystems that can achieve this. LRT is probably most useful for high cache hit workloads. For these workloads the data comes directly out of cache and the only thing between a server and it’s data is subsystem IO overhead, measured here as LRT. The other interesting tidbit from the chart is that the DS5300 with full drive encryption (FDE), (drives which I believe come from Seagate) cracks into the top 12 at 1.8msec exactly equivalent with the IBM DS5300 without FDE. Now FDE from Seagate is a hardware drive encryption capability and might not be measurable at a subsystem level. Nonetheless, it shows that having data security need not reduce performance. What is not shown in the above chart is that adding FDE to the base subsystem only cost an additional US$10K (base DS5300 listed at US$722K and FDE version at US$732K). Seems like a small price to pay for data security which in this case is simply turn it on, generate keys, and forget it. FDE is a hard drive feature where the drive itself encrypts all data written and decrypts all data read to from a drive and requires a subsystem supplied drive key at power on/reset. In this way the data is never in plaintext on the drive itself. If the drive were taken out of the subsystem and attached to a drive tester all one would see is ciphertext. Similar capabilities have been available in enterprise and SMB tape drives is the past but to my knowledge the IBM DS5300 FDE is the first disk storage benchmark with drive encryption. I believe the key manager for the DS5300 FDE is integrated within the subsystem. Most shops would need a separate, standalone key manager for more extensive data security. I believe the DS5300 can also interface with an standalone (IBM) key manager. In any event, it’s still an easy and simple step towards increased data security for a data center. The full report on the latest SPC results will be up on my website later this week but if you want to get this information earlier and receive your own copy of our newsletter – email me at SubscribeNews@SilvertonConsulting.com?Subject=Subscribe_to_Newsletter.